The Freedom From Religion Foundation is drawing attention to a Florida city manager’s unconstitutional social media postings. But if we walk in the light, as he is in the light, we have fellowship with one another, and the blood of Jesus Christ his Son cleanseth us from all sin. I want to encourage you to come to tonight’s event and fellowship with your community. As we enjoy each other’s company, I encourage you to share your faith and know Jesus cleansed us from sin and wants us to love one another. God is our protector and he will deliver us from anything. He gives us the air to breathe and the water to relieve our thirst. He provides shelter when we are cold and food when we are hungry. If you walk with Jesus you shall never want. I encourage you to give him your troubles and the rest is history. 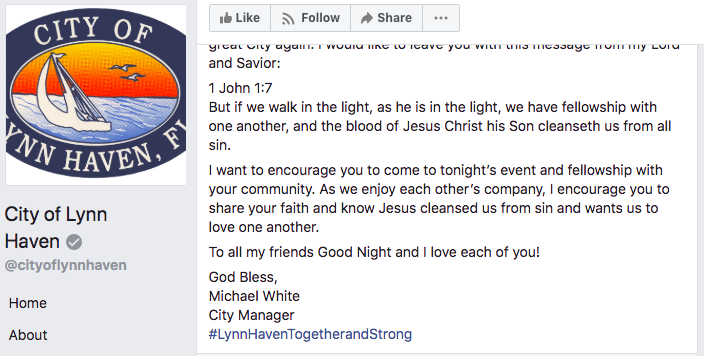 By posting explicitly Christian messages on the city of Lynn Haven Facebook page, such as encouraging readers to “walk with Jesus,” White conveys a message to non-Christians that they are not “favored members of the political community,” FFRF cautions the city. Religious endorsements made by the city or a city official send a message that excludes the 24 percent of American adults who identify as nonreligious, including those residing in Lynn Haven. Finally, FFRF asserts that White’s promotion of Christianity while acting in his capacity as city manager needlessly jeopardizes taxpayer dollars by exposing the city to legal liability. Not long ago, Bradley County in Tennessee agreed to pay more than $40,000 in damages and attorneys’ fees after promoting religion on social media and ignoring objections to the practice. There is no need to expose the city of Lynn Haven to similar liability by continuing to promote Christianity on a government account. The Freedom From Religion Foundation is a nationwide nonprofit organization with the purposes to protect the constitutional separation between state and church, and to educate the public on matters related to nontheism. It has more than 32,000 members and several chapters throughout the country, including more than 1,500 in Florida and a chapter in the state, the Central Florida Freethought Community.